Combines pictures, maps and notes to tell the story of your trip. Exports trip data in a number of formats including Google Earth. It's a great app, but If it could integrate with Foursquare to easily add points-of-interest it would put this app over the top. Also, Google+ export would be nice. This is an amazing award-winning trip documentation app for vacationers and travel explorers. I love to travel. A problem I’ve had over the years is sharing pictures and stories with family and friends of where I’ve traveled. Sure I can download all my photos, and try to recount and piece together my adventures by memory after the fact. But that’s lame compared to what Trip Journal can do. Trip Journal packages your trip pictures and notes neatly in a way that tells the story of where you’ve been what you did. 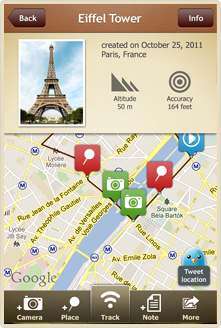 It records your travel path, pictures, notes, landmarks, and can display this information on maps. You can see exactly where and what time pictures were taken. At the end of your trip you have a complete record of your day-to-day activity. But that’s not all: you can also share up-to-the-minute updates along the way so family and friends can see exactly where and what you’re up to, following your trek real-time. Perhaps your audience will learn something new from your expeditions or become inspired to follow your travel routes. It’s like you’re a journalist for National Geographic! I get a kick out looking at old trip routes and travel notes months later. Trip Journal helps to tell the real story of your trip that photos can’t do alone. It helps me remember details and relive moments that otherwise I would have forgotten. 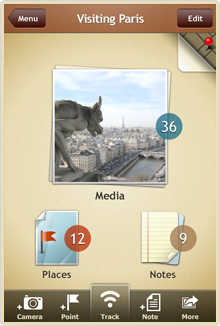 Trip Journal integrates and exports with a few different social sites, like Facebook Flickr and Picasa. You can also export Google Earth files to view on your trip on a computer. Trip Journal is $2.99. 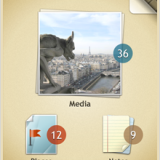 There is a free, “lite” version, however, if want to easily document and share your vacations and trips, do yourself a favor and get the paid version for only three bucks.